Thank you to Sue for sending this postcard from Lismore, New South Wales, Australia. Lismore lies on what was once part of a huge sub-tropical rainforest known as the Big Scrub. Only an estimated 1% of the forest now remains, the rest was cleared by colonial settlers in the 19th century, either to use the land for agriculture, or to sell the timber from the Australian Red Cedar. The tree is now all but extinct in the region, having been unsustainably exploited. Geography Cat has written articles about deforestation which will be useful if you are studying geography; these can be found on his Learning Guaranteed blog. Koalas are not bears by the way. They are marsupials, native only to Australia. The species is listed as vulnerable, which means their population is declining so much that they may become extinct. The major threat to the survival of the koala is habitat destruction. 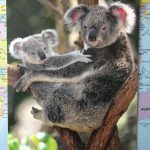 Read more about the issue at Save the Koala.